In an age of transparency it's a wonder how a hotel like The Carlyle has been able to keep such discretion over the years. It's been the temporary home away from home destination for celebrities, politicians, journalists, British royalty, and pretty much anyone that finds themselves of a certain socioeconomic stature ever since its creation. Boasting quality paintings from renowned artists plastered on their infamous bar's walls and decorative input from one of the first ever known interior designers, The Carlyle hotel has from its creation always meant to give off this air of elegant exclusivity that embodied New York aristocratic life while rivaling the style of European hotels. The documentary Always at the Carlyle, while taking us behind the doors and giving us in depth look at the hotel itself really only provides a peek of the transient world within it, one filled with elegance, history, romance, and scandal, and I think that's one of the biggest disappointments for the film. I understand that its discretion is one of the biggest reasons why higher ranking members of society continue to keep the hotel in business, but the documentary does at times give off this "Look at me, I'm rich; and because I'm rich I get to stay in this acclaimed hotel that was meant to highlight the upper echelon of New York's finest, so it's truly an honor to be able to stay (and/or work) here" vibe. If you were to watch this documentary maybe you wouldn't feel the same way and this isn't to blame anyone that's a part of it because they're simply speaking on what they know and have experienced, but I couldn't help but to feel like this entire documentary was a great way for the entity that is The Carlyle and everyone that feeds into it to just scratch its and their own egos. It felt like they were going for some kind of substance with the interviews from dearly beloved employees ranging from the concierge to the maids, elevator operators, performers, and doormen (interviews that I did enjoy listening to); and also with little historical tidbits and mentions of pop culture moments; but, when you have a hotel that prides itself on its discretion and people that are unwilling to go into further details about their stories, it just all comes off as a bit too pompous leaving you wondering why you should even care in the first place. If the gap between the everyday people and the rich wasn't already personally known and/or felt before watching this documentary, there's a high probability that it will be after watching it. After getting past any jealousy and resentment that I may harbor for being a part of the have-nots, I can say that I still enjoyed learning about this celebrated hotel. I didn't know anything about it before watching the documentary and even though the content does kind of leave you high and dry, I did leave it having a better understanding of what it is that the hotel represents for people among that world. All of the people that they were able to get to be a part of this documentary was an impressive feat; it's obvious that this hotel does carry with it a significant amount of meaning for them. 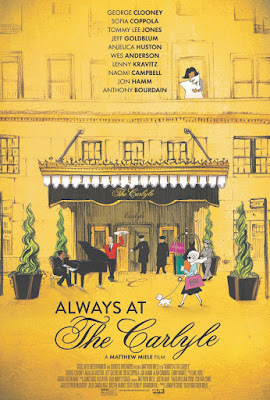 I just wish that we, the people whose lives rarely if ever collide with The Carlyle, could have had more of an understanding as to what that meaning is outside of "a bunch of rich people have stayed here before."